The Rim Trail is located in the Walnut Canyon National Monument near Flagstaff, Arizona. Walnut Canyon National Monument protects over 300 cliff dwellings as well as other sites such as pueblos and pithouses. The Rim Trail gives visitors the opportunity to peer down into the canyon and view some of the cliff dwellings from above. 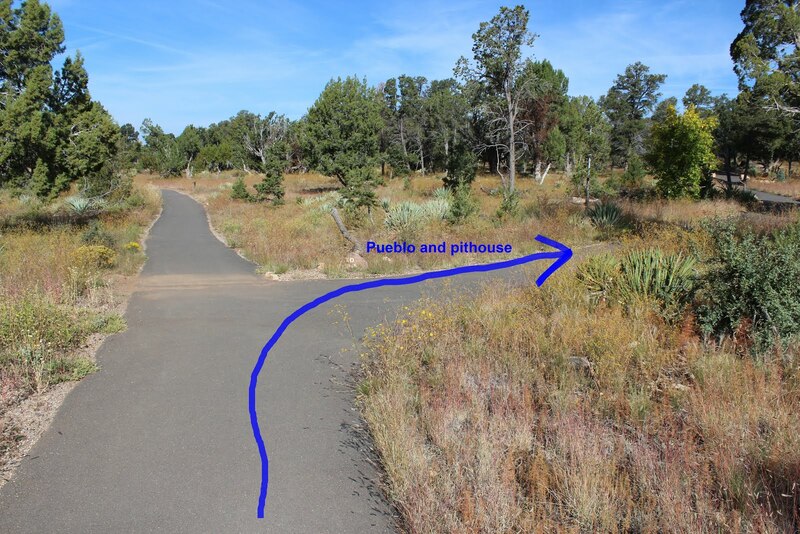 The trail also provides access to the ruins of a pueblo and pithouse. The trailhead is located just east of the Visitor Center. The Visitor Center has a gift shop and museum where you can learn more about the ancient inhabitants of Walnut Canyon. The sign at the beginning of the trail mentions that it is only wheelchair accessible to the first overlook but it appears that the trail has been improved to the point that it might all be accessible. A person could find out for sure from one of the rangers in the Visitor Center. Walnut Canyon is lined with a variety of brush, ponderosa pines and other trees. With all of its natural beauty it is easy to see why it would make an appealing home. Almost every overhang contains the ruins of a cliff dwelling. The whole canyon would have been like an ancient city with people going back and forth to the rim where they grew their crops. The Rim Trail has a relaxing atmosphere with several locations to sit and contemplate the scenery and the history of the area. After hiking out and back to the end of the trail take the right fork and follow the trail as it loops through the picnic area. The partial remains of a pithouse can be viewed beneath a shelter. A few short walls of a pueblo have been reconstructed for visitors to see. There are many rubble piles in the area where other buildings once stood. The Park Service has done a good job with their very informative signs about the original inhabitants and the local flora and fauna. They go a long way to enhance the visitors experience. 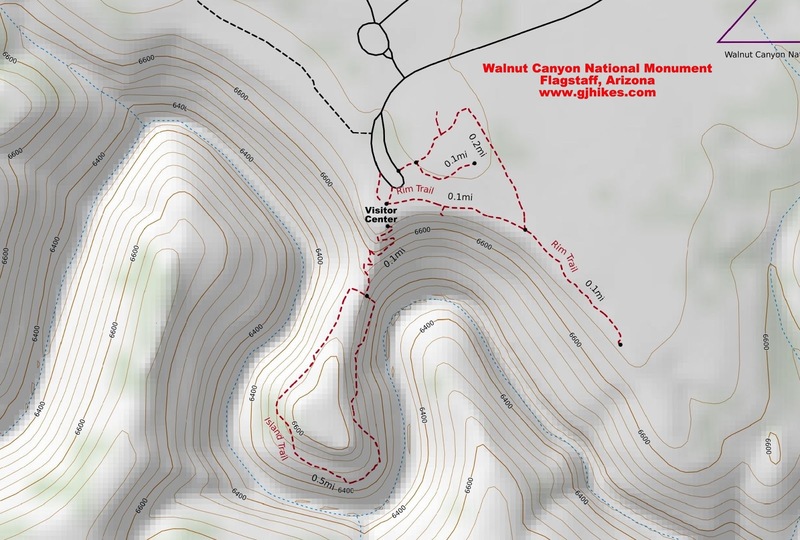 It appears that the Walnut Canyon area received an influx of people at the time of the eruption of the Sunset Volcano near Flagstaff, Arizona. At the same time people had also fled that area and settled at Wupatki and the Eldon Pueblo. The Wupatki National Monument, Sunset Crater National Monument, Walnut Canyon and the Eldon Pueblo can all be visited over a 2 day period or in 1 very long day. If you would like to see it for yourself then all you have to do is 'Take a hike'.